Hello. Today I want to show you what's in the December Sweet Treat Box from Paper, Pen and Plan. Well, as you can see it's packed full of Christmas goodies. Sparkly washi tape, brads, a gorgeous pen, 12x12 sticker sheet with co-ordinating paper, in fact, why not watch my Unboxing video here for the full reveal. 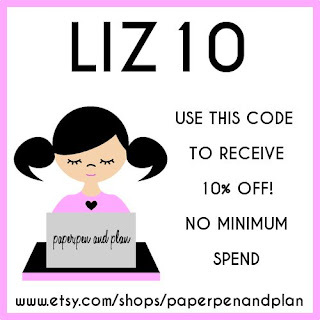 I also have a 10% off code for the Paper, Pen and Plan Etsy shop. Hello. I made some tags! I used My Favourite Things Blueprint Tag die set to cut out the pieces. The cute little skater is 'Little Bits Winter Collection' by Stamping Bella. I coloured with ZIG real brush markers. Sparkly sequins - job done! Hello. Guess what I made at my monthly Craftaholics Anonymous meeting? Three gorgeous felt fairies. I have displayed them on my twiggy tree. Hubby thinks there has been a fairy massacre and they have been impaled. I simply ignore everything hubby says!! So that's another new obsession to add to last months beading - needle felting! Have you seen this on the shelves? It's a bumper boxed kit Die-cutting Essentials (Special Edition). As well as the magazine, which includes my article on new baby cards, you get loads of crafty goodies. A stamp set of 28 stamps, a shop front die, 3 embossing folders and a 98 item paper and topper pack! A great crafty read, loads of inspiration and all those free gifts, go on treat yourself! Hello. So here we are at 1st November - how did that happen? I was going to tell you that these are the first Christmas cards to be made this year but that would be a fib! I made Christmas cards for magazine commissions back in August!! But, these are the first for my own use. Couldn't resist treating myself to some of the new Stamping Bella stamps. The one above is 'Polar Bear and Mousie' and the one below is 'The Walrus, The Polar Bear and The Penguin. I used my Zig Real Brush Markers to colour and the paper is 'Woodland Winter' by BoBunny. I've been thinking for a while that I miss being part of a cardmaking challenge team. I used to be on many teams. Penny Black Saturday and Papertake Challenge to name just a couple. Now I am just a 'no pals' lonely cardmaker. So, if anyone's on a team and they are looking for an extra pair of crafty hands please give me a shout. Be back tomorrow to share what's in this month's Sweet Treat box, see you then!